The world and the new millennium stands witness to revolutionary breakthroughs happening in the medical research arena. New drug or botanical discoveries and therapies that will perhaps cure life threatening diseases and bring about improved quality of life – is the order of the day. All this and more, possible due to endless and tireless work in the area of Research and Development by organizations united on one single front. To meet unending medical demand and necessities and make effective healthcare more accessible to the population at large. Research on humans to harness the goodness of potential drugs has been carried out since centuries. Human Trials are a definitive and most important link in the process of Discovery to Development and Commercialization. However, tales of unethical and almost inhuman conduct related to these trials with little or no protection of subject rights have been etched in history and in the minds of many. The beginning of every change is awareness. A new idea, thought ingrained to bring about a difference is worthy of its cause. Human Trials since long have been a topic of prejudice and of concern to a few. Are they safe? Are they necessary? And many more such queries would always remain in ‘a valley of doubt’ if not answered or addressed accurately. ‘Global Clinical Research Awareness Day’ – An initiative by ClinACE to bring to light the ethical framework of Clinical Research which has undergone an evolution from negative perception, injustice, and manipulation of subject rights to bringing safe, effective and quality healthcare without compromise. It is our endeavor to spread the good word about Clinical Research and Protection of Subject Rights. PhytoCeuticals, Inc., strongly cautions its customers that some claims being made by IS Clinical about their products improperly uses scientific publications, clinical trials and research that are the exclusive property of PhytoCeuticals, Inc. and its founder, Dr. Mostafa Omar. Dr. Mostafa Omar, PhytoCeutical’s president, is the highly respected developer and manufacturer of proprietary skin care formulations and the inventor of Stable Liquid L-Ascorbic Acid (Vitamin C). PhytoCeuticals has developed several formulations, including stabilized liquid L-Ascorbic Acid in 1994. The company had distributed these products through Cellex-C, SkinCeuticals and IS Clinical. PhytoCeuticals permitted these companies the use of these scientific publications, clinical trials and research citations to support the marketing of PhytoCeuticals formulations. PhytoCeuticals terminated its relationship (July 1, 2008) with IS Clinical by Innovation Skincare (Science of Skincare Inc.). Therefore IS Clinical no longer distributes any products using PhytoCeuticals formulations. In addition, these companies surrendered the rights to use this materials for advertising and publicity claims. The only legal use of these studies is to support the sale of products formulated or developed by Dr. Omar and PhytoCeuticals, Inc.
PhytoCeuticals continues to retain the ownership of all its proprietary formulations, as well as the scientific research, publications, patents and grants from National Cancer Institute (NCI) and National Institute of Health (NIH). Since the termination of the business relationship, PhytoCeuticals has received numerous requests from customers who have purchased IS Clinical products, (which do not contain PhytoCeuticals formulations) to exchange these IS Clinical products for genuine PhytoCeuticals PHYTO-C products. Any purchaser of IS Clinical skincare products who is dissatisfied, should return these products to IS Clinical directly for refunds or substitute products. PhytoCeuticals has no responsibility and does not guarantee IS Clinical products. PhytoCeuticals is currently is unaware of any controlled clinical testing, stability testing or research undertaken by IS Clinical with respect to the products it has been selling since July 1, 2008. PhytoCeuticals, Inc. is the market leader in antioxidant skin care products. Established by Dr. Mostafa Omar and based in the United States, the company was awarded NCI grant #1 R43- CA83538-01A1 for “Prevention of UV Photoinjury in Skin by Antioxidants”, NCI Grant #1-R43-CA94484-01 for “Photoprotection of Skin by Topical Selenium” , Olive patent # 6,743,499 B2 and Aleoferon patent # 4861761 & NIH. For further information, please visit www.phyto-ceutical.com or contact us directly at 201-791-2255 or info@phyto-ceutical.com. The advertisement – a 30 second television ad – was created in an effort to put the brand, as well as the Bridgewater Hospital, on the map, and to let the residents of Manchester know that they have a state-of-the-art hospital at their doorstep. The advertisement features a series of women in their daily routines; shopping, swimming, and sitting down for drinks with friends. The theme is body confidence and feeling good about yourself, which is the message the company wants to promote with regards to The Cosmetic Clinic, and which fits with the motto of the clinic: Your body, your choice. Bridgewater Hospital, where The Cosmetic Clinic is based, is a custom-built private medical hospital hailed for its advanced technologies, some of which are unique in the UK. The cosmetic surgery hospital ward consists of private cubicles to ensure privacy for patients, all centrally located around a nurses’ station. The hospital’s diagnostic suite is fully digitised for immediate transmission of information, and equipped with the latest diagnostic radiology equipment. Each of the three operating theatres has been created to meet extremely high air quality specifications as to avoid airborne infections, and a closely observed recovery area has been created so that patients can be monitored as they wake up from their anaesthetic. The Cosmetic Clinic offers a full range of procedures, from breast enlargement, reduction and uplift, to liposuction, tummy tucks, and rhinoplasty. Though the current advertisement targets women, The Cosmetic Clinic offers procedures for both men and women. All surgeons are on the Specialist Register of the General Medical Council, and FRCS (Plas) accredited, to ensure the highest quality of care. Clearwater Aesthetic Medicine has a full aesthetic line to offer patients safer & less expensive options to surgery. This is no spa! Clearwater Aesthetic Medicine is a fully operational medical facility. Patients are under the care of Jayam K Iyer M.D, medical staff or an esthetician. Patients who might have otherwise considered liposuction, a full body lift, or a surgical facelift, can now get similar results using the increasingly popular Velashape or skin enhancing laser. The Velashape is the first FDA cleared device approved for circumferential reduction and the treatment of cellulite. Reduce any body part. Dramatically reduce or remove unsightly cellulite. Lose weight, take off inches without enduring painfull, expensive plastic surgery. With basic aftercare, results from Velashape can be life long. Residents from Clearwater, Bellair, Clearwater Beach, Palm Harbor, Seminole, Indian Rocks, Largo, and St Petersburg who are battling the signs of aging can also take advantage of procedures like Botox injections, Dermal Fillers, Mesotherapy, Deep cleaning facials, enzyme peels & more. The facility is using familiar top of the line products like Botox Rx, Radiesse, Juve’derm, & Latisse. For more lasting results, patients may consider laser skin treatments. Clearwater Aesthetic medicine has one of the latest versitile lasers on the market made by Syneron. This multi-functional laser provides skin tightening, color correction, treats wrinkles, spider veins, age spots, sun damage, and permanent hair removal from all skin types. If you’ve been bothered by inadequate or thinning eye lashes, also known as hypotrichosis, Dr Iyer can prescribe the new Latisse solution. Latisse is a treatment used to grow eyelashes. Making them longer, thicker and darker. Are you tired of dieting , only to watch the weight come off your face, neck, and upper body? The HCG diet is a rapid weight loss program which targets areas of fat which are virtually impossible to lose using standard dieting & exercise methods. By using the hormone HCG , the body is able to burn off that abnormal fat around the belly and thighs. When under a physicians supervision and followed correctly, patients can lose an astounding amount of weight in just one month. If you are not a candidate for the HCG diet, Dr Jayam Iyer has other weight loss programs to accomodate each patient and meet your particular needs. The facility also hosts one of the largest pain management practices in the area. Dr. Jayam Krishna Iyer is a Board Certified Aethesiologist and a veteran pain management specialist. The Creative Health Center and Dr Iyer has been treating the residents of Pinellas County for the past 25 years. By providing pain relieving injections, steroid epidurals, radio frequency lesioning, medication and numerous alternative techniques, chronic pain patients are able to enjoy relief from debilatating and distractive pain. Clearwater Aesthetic Medicine is offering up to 50% discounts on many procedures. If you have been considering a lifestyle change, now is the time to get a great deal while improving your appearance and more importantly….. your health! A sanitising spray that kills 99.99% of Viruses, Bacteria and Germs is now available for purchase in the UK. The SaniGuard wipes, spray and fogger products were invented by David Morgan, president of DEM Technology in the United States.. After patenting the product he was awarded EPA registration for its use on food contact surfaces in 1996. One benefit of the spray is that there is no “wet dwell” time, meaning that users don’t need to wipe the product away prior to it being effective. According to US laboratory reports, the product kills 99.99% of germs in 30-45 seconds. It also exceeds the requirements of EN1276 in Europe. The dry-on-contact spray can be used in between regular cleaning on “hot spot” areas such as telephones, computer keyboards, light switches, door knobs and other areas that are frequently used and rarely cleaned. SaniGuard leaves no film or moisture on surfaces. The spray is effective against Swine Flu, MRSA, HIV-1, herpes, herpes simplex 1 and 2, salmonella typhi, staphylococcus aureus, streptococcus epidermidis and pseudomonas aerginosa and fungi such as trichophyton interdigitolo (Athlete’s foot). MisterSterile.com also offers the Total Release Fogger in a single-release aerosol, which is claimed to sanitise an entire room with the press of a button within 15-20 minutes. The product is available in small room (155ft²) and large room (625ft²) sizes. The company says this product is safe for all surfaces and helps to stop the transmission of germs in high traffic areas such as lobbies, waiting rooms, hospital wards, GP surgeries and patient care facilities. Anti-Bacterial, Anti-Virus Swine Flu prevention products from MisterSterile.com ‘Mr Sterile.com’ is authorised by SaniGuard International and have launched their new website to service the explosive demand for anti-bacterial, anti-virus products. Hair loss is often the hardest aspect of growing old, but for a number of people the problem is not confined to their later years. And it’s not just men suffering from the affliction, with studies suggesting an increasingly number of post-menopausal women are finding their hairlines receding. This new epidemic is a type of alopecia, which damages hair follicles so that hair falls out and cannot grow back. The condition known as Frontal Fibrosing Alopecia (FFA) can cause women to lose up to five inches from their hairline as well as their eyebrows. If FFA goes undiagnosed, women can even lose hair at the sides and back of their head. Scientists believe that FFA is a result of the immune system attacking hair follicles, which causes inflammation at the root. This can damage stem cells in the follicles and prevents hair from growing back entirely. The only treatment available involves controlling this inflammation, so only offers a reduction in overall hair loss rather than a cure. However, the damage for most has already been done and the only alternative is to undergo a hair transplant. The Hospital Group, one of the country’s leading cosmetic surgery providers, is at the forefront of hair restoration surgery, treatments and techniques. Those seeking a solution to their hair loss can undergo a hair transplant, which involves splitting the follicles of existing hairs and relocating them in the sparse area. Providing expert advice and assistance, The Group carries out more hair transplantations than any other clinic in the UK and recognises that hair restoration is an art just as much as a surgical procedure. Since The Hospital Group was established in 1992, it has grown from a small pharmaceutical company to one of the UK’s foremost weight loss surgery providers. Boots have announced the arrival of alli, a new over the counter weight loss medicine. alli (Orlistat 60mg), available at Boots without prescription and is suitable for adults with a BMI (Body Mass Index) of 28 or over, who are prepared to make changes to their diet – and Advantage Card holders who purchase alli from Boots are eligible for a whole host of added savings and benefits. As one of UK’s leading healthcare retailers, Boots is a popular destination for those wanting to find out more about how to lose weight safely and effectively through taking alli. Boots pharmacists are on hand for expert, personalised help and advice without an appointment, and will be able to recommend the best way to help customers lose weight with the help of the weight loss aid, alli. The first step towards losing weight is for customers to find out their BMI, which for a healthy person is between 18.5 and 24.9. Boots has installed easy-to-use Healthy-Weight Check Machines in larger stores throughout the UK which enable customers to ensure they are making the right weight-loss decision for their individual needs. The machines give a healthy weight assessment that measures their height, weight, and BMI at the cost of just 50 pence. For those on a reduced calorie and lower fat diet, they may find it helpful to consider supplementation, to help ensure they are meeting all their nutritional needs while on a diet. Boots UK is the UK pharmacy-led health and beauty retailing business of Alliance Boots. Boots Pharmacy Superintendent is responsible for healthcare advice provided in relation to Pharmacy medicines and other healthcare advice located within the Boots Pharmacy pages of Boots.com. Boots.com is the trading name of Boots UK Limited (registered number 928555) a member of Alliance Boots. All other information and advice on boots.com is the responsibility of Boots UK Limited. The world’s most beautiful people are ditching the ‘heroin chic’ look of gaunt faces and sharpened cheekbones and instead opting for apple-shaped cheeks and rounded foreheads. The recently reported LA trend for the so-called ‘pillow face’ is seeing celebs swap Botox for plumping treatments. Now, inspired by the likes of Kylie and Madonna, women in London are embracing the smooth, padded look sported by the stars. The Harley Medical Group, the UK’s largest cosmetic surgery provider, has anticipated the uptake of the trend in London by launching Sculptra, an injectable volumising treatment – in its six London clinics. Thanks to growing demand for ‘apple’ cheeks, the introduction of Sculptra has been its fastest ever non-surgical launch. Sculptra stimulates the build up of the body’s own collagen. Like more traditional dermal fillers, Sculptra is introduced into areas of the face that have lost their natural plumpness and elasticity. The non-permanent restoration of lost facial volume gives smoother, younger-looking skin. The main ingredient of Sculptra is Poly-L-lactic Acid. The PLLA works from deep within the skin’s layers stimulating the body’s own production of collagen. Poly-L-lactic acid has been used in surgical procedures for over 25 years and is gradually and naturally broken down by the body. The Harley Medical Group is the UK’s largest cosmetic surgery provider, performing more procedures and with more cosmetic surgery clinics than any other provider. It has been established for over 25 years and is one of the most highly-regarded Cosmetic Surgery Groups operating in the UK, with over treated 435,000 patients to date. The Harley Medical Group is renowned for introducing and pioneering most new surgical and non surgical techniques to the UK and Irish markets, such as Aesthera PPx, Laser Hair Removal, Cool Touch Laser, Silk Touch Laser, Collagen for lines and wrinkles, Laser for snoring, Tumescent Liposuction, LPG cellulite treatment etc. All new treatments and techniques are first thoroughly researched and tested before they are submitted for approval by the Group’s Medical Advisory Committee, as being suitable for application by the Group’s fully trained and specialized Plastic Surgeons, Doctors and Treatment Nurses. The Harley Medical Group has launched a special discount on all non-surgical and surgical treatments for all registered nurses. The 10% non-surgical discount and a £250 reduction on all surgical procedures will be available across The Harley Medical Group’s 26 clinics and can be taken up by nurses throughout the summer. National Nurses’ Day is celebrated on 12th May each year, as a tribute to the work of Florence Nightingale who was born on the day in 1820. All patients considering cosmetic surgery should ensure that their surgeon is trained and registered in the GMC Specialist Register as a Plastic Surgeon and ensure that their first consultation is carried out by a medical professional. All consultations at The Harley Medical Group are carried out by a fully qualified Cosmetic Surgery Nurse Counsellor. The Harley Medical Group is the UK’s largest cosmetic surgery provider, with 26 clinics nationwide, performing more procedures and with more clinics than any other cosmetic surgery provider. It has been established for over 25 years and is one of the most highly-regarded Cosmetic Surgery Groups operating in the UK. It has treated over 435,000 patients to date. The Harley Medical Group has reported that UK men are becoming more preoccupied with their appearance, especially within four key career areas. The increase in awareness and anxiety amongst men that their bodies may not look their best, has been met with an explosion in the number of slang terms for unwanted areas of the male body, along with rise in the number of operations to remove them. The cosmetic surgery operation to reduce male breast tissue, or ‘moobs’, is now relatively commonplace, but the removal of ‘Simon Cowells’ (modern day rhyming slang for jowls), and the removal of ‘mandles’ (male love handles) are also becoming more popular than ever. The demand for male cosmetic surgery is in part being driven by long working hours and work stress, according to the UK’s largest cosmetic surgery provider, The Harley Medical Group. An audit of the most common career choices amongst the UK’s burgeoning male cosmetic surgery market revealed that some punishing careers appear to be taking their toll on British males, who are now seeking the help of the UK’s leading surgeons to turn back the clock. Liposuction on ‘mandles’ and ‘moobs’, face lifts including mini-face lifts to improve the jowls, or ‘Simon Cowells’, are amongst the most popular male procedures in 2009. Rhinoplasty and Otoplasty are also proving popular; particularly amongst male cosmetic surgery patients aged 25-35, and ‘Boytox’ (Botox for men) – continues to be very popular, up 12% year-on-year. All patients considering cosmetic surgery should ensure that their surgeon is trained and registered in the GMC Specialist Register as a Plastic Surgeon and ensure that their first consultation is carried out by a medical professional. All consultations at The Harley Medical Group are carried out by a fully qualified Cosmetic Surgery Nurse Counsellor. The Harley Medical Group has been established for 25 years and has 26 clinics in the UK. The Harley Medical Group is the UK’s largest cosmetic surgery provider, performing more procedures and with more clinics than any other cosmetic surgery provider. It has been established for over 25 years and is one of the most highly-regarded Cosmetic Surgery Groups operating in the UK. It has conducted over 435,000 procedures to date. The Harley Medical Group is renowned for introducing and pioneering most new surgical and non surgical techniques to the UK and Irish markets. All new treatments and techniques are first thoroughly researched and tested before they are submitted for approval by the Group’s Medical Advisory Committee, as being suitable for application by the Group’s fully trained and specialized Plastic Surgeons, Doctors and Treatment Nurses. The Harley Medical Group has reported a rise in breast augmentation surgery, with a growth of 27% year on year. This increase has been driven by a boom in post baby surgery, with mothers now accounting for 60% of breast augmentation patients, making it the third most common type of post-natal procedure. Breast augmentation surgery was first performed in 1895 and is today the most popular surgical cosmetic procedure for women. During the procedure an incision is made in the crease of the underside of the breast and the implant is inserted into a pocket created by the surgeon. The result is fuller and more evenly shaped breasts. The treatment takes around one hour to perform and a general anaesthetic will be administered to the patient. Breast augmentation surgery at The Harley Medical Group costs from £4,275. For more information visit the www.harleymedical.co.uk. The Harley Medical Group is the UK’s largest cosmetic surgery provider, performing more procedures and with more clinics than any other cosmetic surgery provider. It has been established for over 25 years and is one of the most highly-regarded Cosmetic Surgery Groups operating in the UK. It has treated over 435,000 patients to date. The Harley Medical Group works tirelessly to maintain the highest standards in the industry for the benefits all cosmetic surgery and non surgical patients. We are currently at the forefront of the campaign to ensure that the Government continues to regulate the use of certain laser types used in cosmetic surgery and non surgical treatments so that patients are protected from rogue practitioners. All of The Harley Medical Group’s clinics are registered with the Healthcare Commission and there are now 26 clinics in the UK and Ireland: London (Harley Street, Wimbledon, The City, Chiswick, Finchley & Watford), Marlow, Birmingham, Leeds, Brighton, Bristol, Manchester, Newcastle, Chester, Nottingham, Southampton, Cardiff, Chelmsford, Dublin, Northampton, Cambridge, Maidstone, Belfast, Reading, Sheffield and Liverpool. Advanced Technology Laser Company (ATL), a leading provider of aesthetic laser products, today announced that it has received 510(k) clearance from the US Food and Drug Administration (FDA), enabling the Company to manufacture and market its Angelite family of intense pulsed light skin therapy systems. The Angelite Family of Intense Pulsed Light Systems (inclusive of the hand pieces used to deliver pulsed-light energy) will be widely used in the area of photothermolysis, photocoagulation and dermatology, especially for surgical, aesthetic and cosmetic applications in the treatment of acne, various benign pigmented lesions and hair removal, that require in. Angelite Intense Pulsed Light System uses wavelengths ranging from 400 – 950 nm for the treatment of inflammatory acne, and wavelengths ranging from 560 – 1200 nm are indicated for the treatment of benign pigmented (epidermal and coetaneous) lesions including warts, scars and striae, and for the treatment of benign (coetaneous) vascular lesions including hemangiomas, facial, truncal and leg telangiectasias, rosacea, melasma,angiomas and spider angioma, poikiloderma of civatte, leg veins, facial veins and venous malformations. Wavelengths ranging from 700 – 1200 nm are indicated for the treatment of unwanted hair. Advanced Technology Laser Company (ATL) is a high-tech company and has been recognized to be a leading company in developing, manufacturing and distributing medical laser and optoelectronic systems. At ATL, a solid R&D team keeps strong connections with universities and research institutes all over the world, assuring it to produce cutting-edge products. Our goal is to continue bringing you the latest technologies and best quality products in industry of medical laser and optoelectronics at the affordable prices. For more information, please visit http://www.LaserATL.com. Fine lines reveal the secret of a person’s age. The skin around the eyes is particularly sensitive and fragile. Do not wait until you have fine lines and wrinkles to start using eye creams. It is difficult to eradiate fine lines and wrinkles after their emergence. Taking preventive measures – apply an eye cream that delivers anti-aging and firming functions sooner is the best way to fight eye wrinkles. Generic and lifestyle aside, half of your success of preventing and reducing fine lines and wrinkles relates on choosing the appropriate anti-aging eye cream, and the rest is how to apply an eye cream correctly. Protecting the eye skin area by coating it with the appropriate eye care products daily and nightly are the basic steps. When applying an eye cream, do not indiscriminately wiping or spreading it over the eye skin area. It is necessary to use a correct method to help the eye cream to penetrate into the skin effectively. Understand your skin type and do some research before buying an anti-aging eye cream on whether its ingredients are appropriate to your skin. This helps the skin care ingredients to address the problems of the skin more effectively and the possibilities of irritation and inflammation can be greatly reduced. Pick an anti-aging eye cream with sufficient amount of active ingredients. The effectiveness of reducing wrinkles and fine lines depends on whether the active ingredients (e.g. high strength ascorbic acid, growth factor, peptide to name a few) work on your skin and penetrate into your skin with sufficient amounts. Start with the lowest possible concentration of active ingredient. Before trying the eye cream on the eye skin area, apply it on the neck first. If no irritation occurs in 24 hours, you can apply it to the eye skin area. After 2 weeks, you can consider increasing the strength if needed. Cleanse the skin before applying any products. Apply the eye cream when the skin is still moist. Using heat of the fingertip to warm the eye cream, and then use the middle finger to gently press the eye cream on the eye skin area. Spend a few minutes every day for a deep massage over the eye skin area. Not only can it enhance ocular circulation, but also reduce the appearance of dark circle and puffiness. Apply a non-comedogenic sunscreen on the eye skin area during the day time. Do not apply acne products on the eye skin area. Also do not apply too many eye care products on the eye skin area at one time. 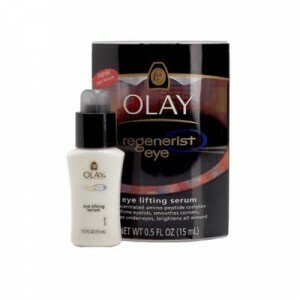 Olay Regenerist Eye Lifting Serum contains a concentrated form of amino-peptide complex that hydrates to firm and visibly lift skin around the entire eye area. Skin’s natural glow will be restored and skin is left feeling velvety smooth. Perfective Ceuticals Anti-imperfection Eye Therapy Cream (for mature skin) is consisting of unique combination of human growth factors, matrixyl, retinol, and ginseng extract to ensure complete care for the skin surrounding the eye area. An “Eye Lift in a Bottle”, Perfective Ceuticals Anti-imperfection Eye Therapy helps fight fine lines, wrinkles and under eye bags while moisturizing and firming the delicate skin around the eyes. Ultraceuticals Dark Circle Eye Cream (for dark circle) contains pure retinol and vitamin K to significantly reduce the appearance of discolouration under the eyes. Valmont Elixir Des Glaciers Vos Yeux (for puffiness) is enriched with decongestive green tea and arnica extracts and draining Red algae and caffeine extracts to: lift the wrinkles and fine lines around the eyes, remove dark circles and unsightly puffiness. Most people have heard of ‘duvet days’ and even Christmas shopping leave. Now some businesses are introducing ‘Botox leave’ in a bid to deter employees from taking sick leave for their pre-party beauty treatments. Cosmetic surgery provider, The Harley Medical Group has reported that enquiries for Botox treatments have increased by 21% over the last six weeks, and has noted that a number of businesses have introduced ‘Botox leave’ to cope with increase demand from their staff looking to take time off for beauty sessions. Businesses have introduced two hours leave to ensure staff can make their annual appointment for the £210 jab with their Botox Doctor without taking unauthorized leave. Recruitment company, Blue Skies, said; “Companies are right to be inventive with their incentives. Although ‘Botox leave’ is certainly quirky, if people are adopting this incentive there is obviously a call for it. In the current market, giving people time off for endeavours that suit their lifestyles can be a cost effective way of incentivising staff if budgets do not stretch to other more obvious benefits”. Stephen Fox, Managing Director of Fox Kalomaski, the marketing and advertising agency, commented; “We noticed a demand amongst our staff for a day off in the run up to Christmas to not only pick up their Christmas gifts, but also to make appointments for their hairdressing, beauty and particularly Botox treatments. We now offer all staff a day’s leave in December and have unofficially called this day”Botox Leave” because we’ve heard rumours that this is what people do with this day – to make sure they’re looking their best for the Christmas party photos”. The Harley Medical Group is the UK’s largest cosmetic surgery provider, performing more procedures and with more clinics than any other cosmetic surgery provider. It has been established for over 25 years and is one of the most highly-regarded Cosmetic Surgery Groups operating in the UK. It has conducted over 450,000 procedures to date. All new treatments and techniques are first thoroughly researched and tested before they are submitted for approval by the Group’s Medical Advisory Committee, as being suitable for application by the Group’s fully trained and specialized Plastic Surgeons, Doctors and Treatment Nurses. Further information is available via The Harley Medical Group website or the cosmetic surgery blog. There are hundreds of skin care and anti-ageing products sold in the market. All these products promise one thing, to keep the skin young looking. Through this reviews, the public will be equipped with ideas about these products for them to make a good investment. Beautiful Review, an online based company dedicated to providing unbiased reviews on leading cosmetics, skin care, and anti-ageing products, announced their findings after concluding their review on six other skin care products. The company has been providing several other reviews in the past. Products reviewed include companies providing skin care formula and therapy and leading cosmetics available today. The company’s latest findings cover AlphaDerma CE, Derma Wand, Hydroderm, La Mer, Meaningful Beauty, and Natural Advantage. AlphaDerma CE – Alphaderma CE is an expensive skin care formula manufactured by Janson Beckett’s company. The product contains Dimethylaminoethanol (DMAE) which research shows to help develop alertness and vigilance; in some cases it shows to reflect a positive mood impression. DMAE also helped in extending the lifespan on the subject of the study. Other ingredients labeled on AlphaDerma CE include Argireline and Vitamin C Ester, Elastin, and Soy. Elastin is a protein found in connective tissues that is proven to help restoring tissues of the body to its original shape. The product does not contain Hyaluronic Acid which a common ingredient on most skin care formulas. HA is proven to help the skin look younger, smoother, and more radiant. Derma Wand – Derma Wand is a hand held device effective for maintaining and developing healthy skin. It works similar to treatment done in spa where parts of the face are massage. The process helps in tightening and lifting the area of concentration making it younger looking when done regularly. It also helps increase the Collagen presence of the body to enhance the skin. The product has not yet been proven effective and no research is associated with the product. The company is offering free trials of their product for interested individuals. Hydroderm – Hydroderm, a California based company that manufactures several skin care products including exfoliates, moisturizers, creams, and anti-ageing products. Hydroderm’s Age-Defying Wrinkle Reducer is formulated to deliver a “brighter and smoother” skin. Hydroderm’s Age-Defying Wrinkle Reducer does not label a complete list of ingredients used including what type of Collagen is used. It is unknown if it contains ingredients including Hyaluronic Acid and Matrixyl 3000 that are commonly found in leading anti-ageing products. In addition, there is still no related research about the product posted on the manufacturer’s website. La Mer – La Mer is a well known maker of luxurious skin care and anti-ageing products. Among their pride is the Crème de la Mer that carriers the company’s success. It is known to be a product of “miracle broth”, a process popularize by former NASA scientist, Dr. Max Huber. The company’s website offers an FAQ page to direct visitors with their basic inquiries. Crème de la Mer is an expensive product and introduced at prices close to $110 per ounce. It does not contain Collagen-boosting ingredients as what most anti-ageing products offer. Meaningful Beauty – Meaningful Beauty Facial Masque is a product of Dr. Jean-Louis Sebagh, a renowned dermatologist based in Paris. The company manufacturers other line up of skin care and anti-ageing products. Meaningful Beauty Facial Masque contains several ingredients including water, Ginkgo Biloba Leaf Extract, Eucalyptus Globulus Leaf Oil, and Cucumis Sativus (Cucumber) Fruit Extract. The product contains basic ingredients found on most anti-ageing products, but does not contain Hyaluronic Acid and Argireline®. Most products sold in the market contain Hyaluronic Acid as a major component in their formulation. Natural Advantage – Natural Advantage is an anti-aging system designed to help develop and restore youthful glow of the skin. The starter kit is composed of three individual products to kept a fresh feeling, protect against sun’s harmful effects, and help prevent wrinkles. This includes Natural Advantage® Daily Cleansing Gel (2 oz. ), Natural Advantage® All Day Moisture with SPF 15, and Natural Advantage® Nighttime Renewal Complex. From the findings, the products presented may not contain any presence of Matrixyl 3000® as compared to other known products sold in the market. Beautiful Review is an independent company committed to providing the public with unbiased reviews about general cosmetics widely sold in the market today and their manufacturers. Reviews are written by hand and products are tested and examined by human editors. The company can be reached through their website at beautifulreview.com. The numbers of beauty products sold in the market have mushroomed and will continue to grow in unison with the latest discoveries of ingredients and ways of reverting the skin’s ageing. Since BeautifulReview.com was established, it has provided product reviews including companiesmarketing beauty products, beauty services, and top selling cosmetic and anti ageing items sold to the public either online or through local stores. Restylane: Restylane is labeled to contain hyaluronic acid, a component normally found in many tissues such as the skin and cartillage. It is recommended to prevent and cure severe skin damages and could be administered to the patient through injection therapy. A doctor’s prescription is needed before anyone will be allowed to purchase Restylane. Precaution Against Imitation: Packing of the finished product does not contain any complete ingredients label as a precautionary measure to prevent any prospective consumer from procuring these ingredients individually, thereby assuring that no unauthorized production or imitation is undertaken by anybody or any entity. Indication: Side effects of Restylane may include red or swollen skin that normally last up to seven (7) days. StriVectin-SD: Strivectin-SD, manufactured by Klein-Becker, prevents skin wrinkles and lessens stretch marks caused by pregnancy. Klein-Becker strongly recommends a patch test before applying the product for regular use. Among the products manufactured by Klein-Becker are StriVectin Eye Cream and other age-defying medications for both men and women. Packing and Label: StriVectin-SD products are packed and shipped without any label and complete list of ingredients to prevent any imitation or unauthorized production. On the manufacturer’s website, the product is said to have passed clinical tests, however no actual test results are presented on the website. Thermage: Thermage is a reputable company marketing skin-care techniques for women. The procedure is said to trigger “heat” to the Collagen Strands causing it to tighten. A skin treatment session can last from 20 minutes to 2 hours depending on the area of concentration. Indications: The company strongly recommends the procedure to be done only on women aging 35 to 60 years old. It is known to be costly and the company does not offer a money back guarantee. Youthful Essence: Youthful Essence is a home microdermabrasion system marketed by Guthy-Renker. The package contains a Vitamin-Enriched Resurfacing Cream, two sponge applicators, and a watertight resurfacing tool. It is advertised to be applicable for you for facial and body treatments. Side Effects: The company does not provide free trial products to interested individuals. In addition, the abrasive crystals produced after the application may irritate sensitive skins. Youthology: Youthology is a product brand used in various skin care and anti-ageing products. Among the company’s products are the Nighttime Nourisher and Daytime Nourisher effective to moisturize skin and prevent it from ageing. Disadvantage: Most of the company’s products do not contain Matrixyl 3000®, a combination of Palmitoyl Oligopeptide and Palmitoyl Tetrapeptide – 7, as compared to other skin care products. Beautiful Review is an independent company committed to providing the public with unbiased reviews about general cosmetics widely sold in the market today and their manufacturers. Reviews are written by hand and products are tested and examined by human editors. The company can be reached through their website at http://www.beautifulreview.com/.